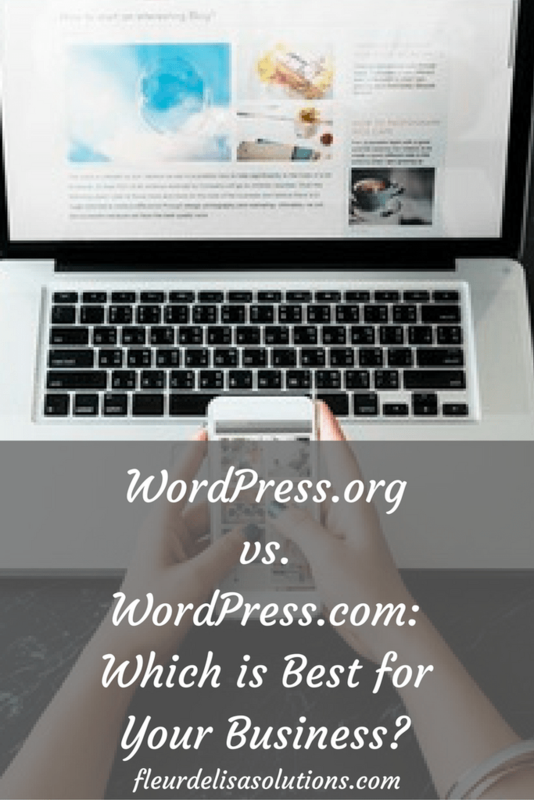 WordPress.org vs. WordPress.com: Which is Best for Your Business? 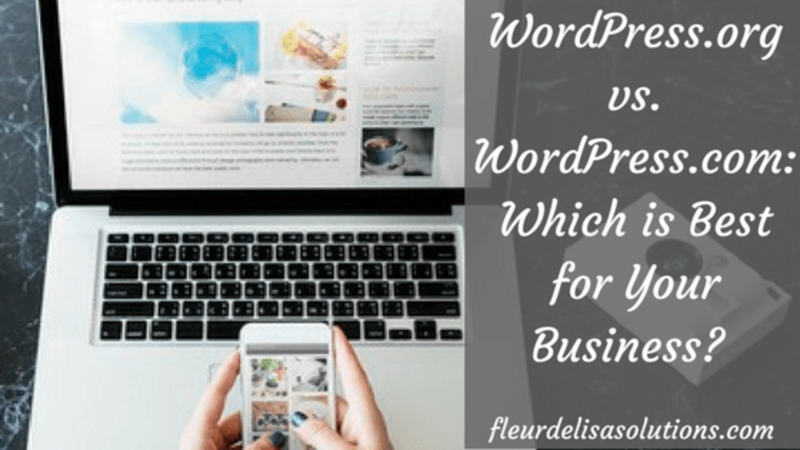 One of the most frequent questions I get about blogging is about WordPress. Business owners and entrepreneurs come to me for help with their blogs or to start a blog and want to know the difference between WordPress.org and WordPress.com. Unless you researched this topic, you may not be aware of the huge difference between the two. So, if you are thinking of starting a blog, migrating from another blog platform, or even if you already have a blog on WordPress, you definitely want to consider the differences. WordPress.com is great for beginners. This platform is free and easy to use. It is great if you blog for fun and not to make money. The free templates allow you to create a beautiful blog. However, WordPress.com has limited functionality and plug-ins, so if you think you will want to make money from blogging, my recommendation is to start out on WordPress.org to save yourself the headache of migrating your blog later. If you have your own business (not a direct seller or part of a larger organization), you probably want to consider WordPress.org for reasons discussed later in this article. However, if you are a direct seller or work for a larger organization, WordPress.com may be just what you need to spotlight your business in ways that company websites direct sellers get just cannot do. The point is, your blog site should be branded to you and not your company. However, as long as the company allows you to link to their site from your blog site, you can still direct traffic to your sales pages on the company site. More things to consider with WordPress.com is your URL and ownership. Since this is free and hosted by WordPress, your domain URL will reflect this. Instead of having a URL such as YourCompanyName.com, your web site domain URL will look more like WordPress/YourCompanyName.com. Essentially you don’t own it and everyone knows it is a free site. This may or may not matter, depending on how you are using your blog site. If you need to keep costs down and just can not afford a self-hosted site right now, WordPress.com is a great place to at least start to get visibility for your business. Another option is to pay to get "WordPress" removed from the URL. This may well satisfy your business needs. However, one thing to be aware of is that you still won't have access to many of the awesome plugins available on self-hosted sites. Learn more about our Blogging Services! This is basically the big sister. The more “grown-up” choice. I only use these terms because of the robustness of WordPress.org. In fact, it is so robust that some major companies use it as their platform of choice. Some examples of companies that trust WordPress are Forbes, Fortune, The New York Times, and Sony Music. While there are many more examples of larger companies utilizing the robustness of this platform, I am sure you can see why it is a platform to consider for your business. One of the main advantages to note is that WordPress.org is a self-hosted site. While that means there are additional hosting fees involved, it also means you own and control the website. Plus, with a self-hosted website, your URL will be more professional and will reflect the name of your business instead of drawing attention to the platform on which it resides. So what draws and keeps so many businesses on these self-hosted WordPress sites? The robustness and flexibility of the platform! Whether you just want a simple website for your business, are looking for e-commerce features, or a membership site WordPress can handle it. With the many plug-ins available to users, you can make your website do just about anything. And if you know coding, or want to hire someone, you can customize your website to be the awesome web site you envision. Remember, not everyone needs robustness and bells and whistles. For some, a simple blog site is all that is necessary to build the platform you need to succeed. If you are still unsure, schedule a 15-minute call with me. I can help you understand which version is best for you and why. I hope this cleared up some of the main items of confusion between these two platforms. They are both great and I personally use both of them. The main question to ask yourself is if you need a fully functional website or just a blog space to differentiate yourself. For many direct sellers, a blog space may be sufficient, but if you plan on expanding that direct selling business into other things, then you may want to consider a more robust platform. My recommendation is if you own your own business with your own products and services is to go with WordPress.org because it will be able to grow with your business. If you need help getting started blogging, need to figure out what to blog about, and want to explore some additional techniques, simply schedule a call with me HERE to move your business forward TODAY!